Wholesale electricity over 87 cents/kWh $2/kWh. Are you helping keep rates low? It’s a hot day in New England, with temperatures as I write over 90°F. Air conditioners are running hard, and the regional grid is at full tilt. To supply the needed electricity, utilities and independent power producers are turning on their “peaker” power plants—facilities that sit idle most of the time, and only get used during periods of high demand. 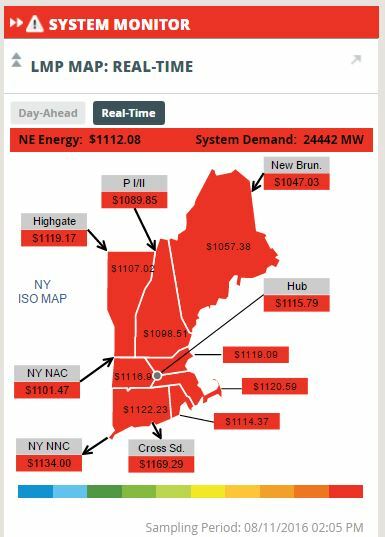 These power plants are extremely expensive, and when they are called into action regional spot-market wholesale electricity prices skyrocket. I checked the wholesale prices five minutes ago. 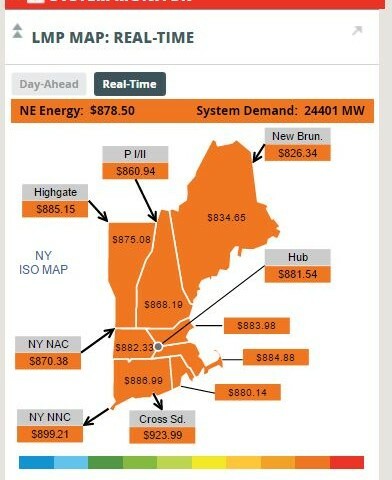 The screen grab below shows that the current price is over 87 cents per kWh! That’s what the utilities are paying right now for the extra energy they need. So while they pay over 87 cents/kWh, they sell it to us at between 10 and 20 cents/kWh, depending on the utility and the rate plan. In other words, at a time like this, utilities are losing money hand over fist. And they will need to make it up the rest of the year. If utilities can buy less of this super-expensive power, then rates all year round can stay lower. Alongside efficiency and conservation (if you have A/C, turn your thermostat up a few degrees! ), one of the best ways to avoid this high-cost power is with solar. 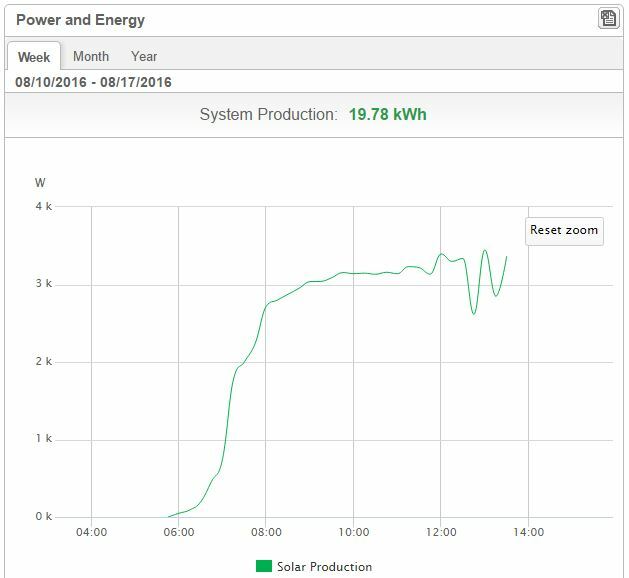 Here’s a screen grab of solar production from one of our customer’s trackers, taken a few minutes before the cost image above. This is typical of days with high-cost electricity. Electricity is expensive right now because it’s a hot day and so much is being used for air conditioning. It’s a hot day because it is summer and sunny. What do solar panels do on sunny days? They make electricity! 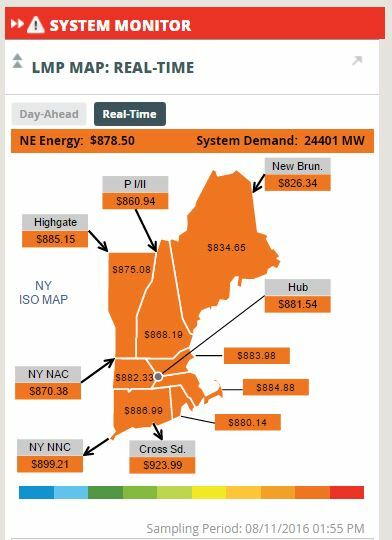 So this tracker—and all the other Solaflect trackers out there—are producing lots of electricity at a far, far lower cost than grid wholesale. Every kWh coming out of the trackers is a kWh that the utilities don’t have to get from the wholesale spot market. That saves the utility a lot of money, and helps keep all of our rates low. This Solaflect customer is both saving money directly with their solar production, and helping their neighbors save money in the long run by keeping rates lower. You can do the same. UPDATE: ten minutes after writing the above, New England wholesale electricity has gone up above $1 per kWh! UPDATE #2. I checked in again at 5:30 pm. The cost for spot market electricity has been over $1 per kWh for about two and a half hours, so far. At shortly before 3 pm, it peaked out at a whopping $2.69 per kWh!